This is the perfect young artist’s projector, newly redesigned for 2015. With an appealing new shape, and bright new graphics, the EZTracer® is poised to bring art and crafts creativity to the next generation of artists. The EZTracer® easily enlarges any design or pattern from a 4 x 4 inch (10.2 cm x 10.2 cm) copy area onto a wall or easel from 2 to 10 times enlargement. 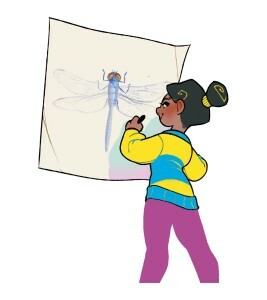 Projected image can be easily traced and colored as desired. No set up necessary and simple to operate. UL approved. One year warranty. Enlarges flat artwork or small 3-D objects from 2 up to 10 times onto any vertical surface. Horizontal projection onto any vertical surface. Ready when you are – no set up or assembly. Copy size: 4 x 4 inch / 10.2 cm x 10.2 cm. Work in sections with larger designs and prints. A 15-watt or 1300-lumen LED bulb is the equivalent brightness for the 23-watt CFL bulb.The 23-watt CFL light bulbs (with the spiral shape) were the most common type of light bulb to find up until the last year or so. Now they’re becoming difficult to find. If you’re having trouble finding CFL bulbs for the Tracer and EZ Tracer, you may use the LED-equivalent bulb, which should be available at your local hardware or home improvement store. DO NOT use an incandescent light bulb in the Tracer or EZ Tracer! Incandescent light bulbs get too hot for the projector.